On Tuesday, April 11, Melville House released THE MIRROR THIEF in a paperback edition with a brand-new cover design. The paperback is available from booksellers worldwide, and can also be ordered through the Melville House website and from all major online book retailers. Melville House has also produced an informative video (embedded below) providing a behind-the-scenes look at the process of converting a hardcover into a paperback. 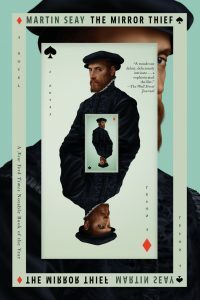 The Chicago Review of Books—which named THE MIRROR THIEF the best debut of 2016 by a Chicago-area author—has published an interview of Martin by editor Adam Morgan on the occasion of the paperback release.